Glowing Sokoban was available as a giveaway on January 29, 2019! Glowing Sokoban is another Unity game from Falco Games, and created by Flying Stone Production. you can see a mixed bag of Steam community reviews HERE. Installation includes five shortcuts installed to the desktop, four of which ((i.e. FalconLine Online Games Website & FalcoGo WebGL Games shortcuts)) can be deleted. The unzipped giveaway file includes a read me and a free standing game executable. When booting up the game you are first presented with a selection of other free games that you can download by clicking on each respective image (racing, billiards, chess, FPS, zombie games etc), however when I clicked on these I received a warning from my Heimdal security (apart from the kill a zombie game). From the main menu you can adjust the graphics between low, normal and good. I initially played four levels then closed the game down. On restarting I had to start from the beginning again. I repeated this to level 7, then restarted, but again had to start from the beginning, so there appears to be no save feature in the giveaway version. The graphics are basic, but the puzzles are challenging enough once you've progressed past the first few, (which are very simple). 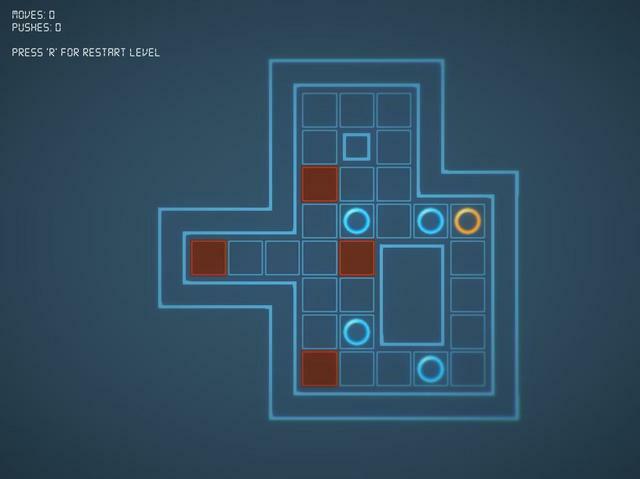 The playing arena is divided into a grid of blue and orange squares. 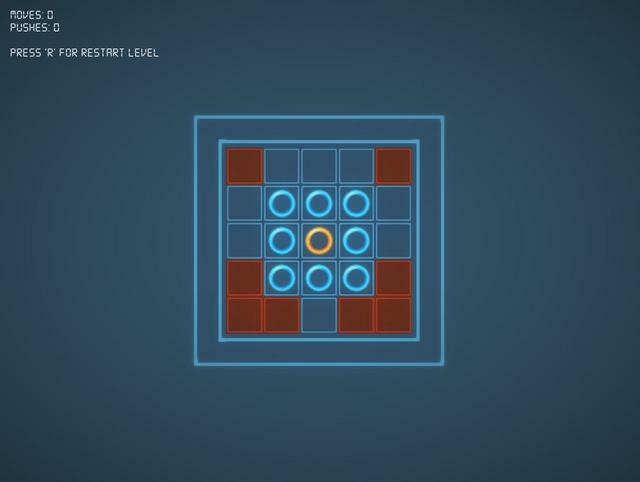 The aim of the game is to move blue circles to the orange colored squares in as few moves as possible. 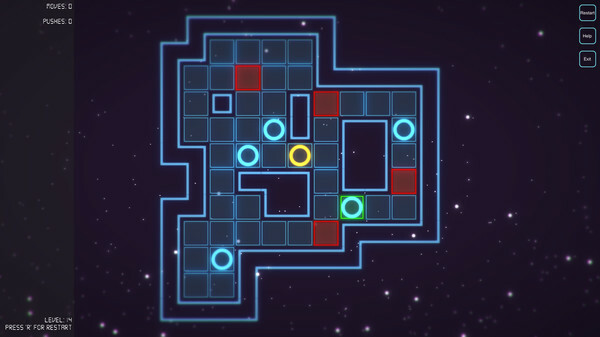 To make it more difficult, smaller blue squares/rectangles have been strategically placed around the grid. You cannot move your circles over these squares. 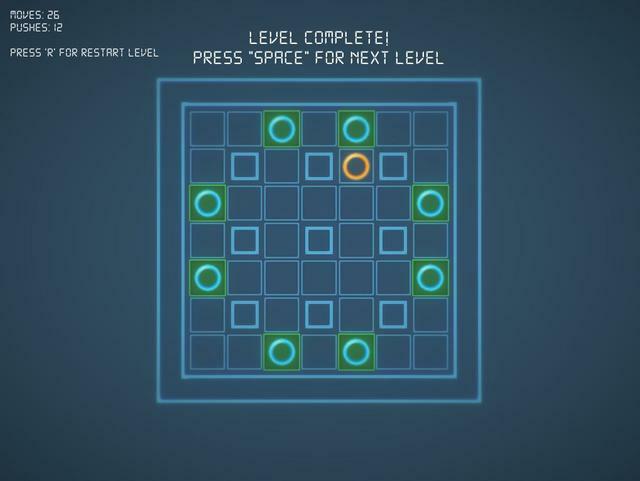 To move a blue circle you use the WASD or the arrow keys to move up down left and right using the orange circle. In the top left of the board you can see the number of moves you've made and the number of pushes. You can also restart the level using the R key. You can see a couple of videos of game play, the first showing a brief glimpse of the first 54 levels and the second the first several full levels HERE & HERE (русский).. 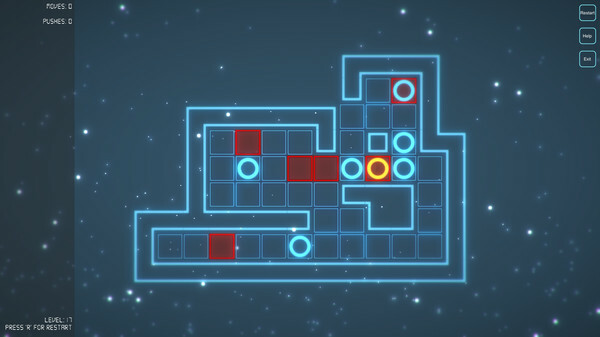 The videos are from the Steam version which differs slightly from the giveaway version as it includes a 'how to play' section in the main menu plus the level number and a help button are included on the game board. All three of these are missing from the giveaway version. You can buy the game via Steam for £0.79/$ 0.99 HERE. 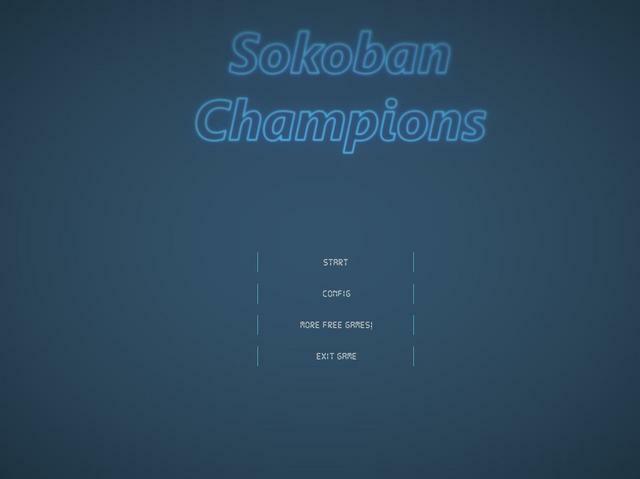 Overall a worthwhile download, especially if you like the sokoban genre. Sokoban (倉庫番) is the Japanese word for Warehouse keeper; where the player represents the warehouse keeper and pushes boxes around a warehouse. :) Unfortunately I don't have time to continue playing the game, so cannot verify the 10 level limitation on this version of the game. it looks like a different version to the one sold via Steam due to the differences mentioned above. If you're having problems installing or activating or getting Glowing Sokoban to work please visit the FAQ's Thread HERE and read through the communities comments because sometimes fixes have already been posted, for example, a common issue seen since the Themida wrapper was introduced three years ago is that some community members installation of the game are blocked by their security because Themida code has been known to hide malware, (usually an error message is flagged for example 'The executable is corrupted' even though in reality it is not); so as a precaution some anti malware programs will block and even delete the suspect installation files even though the files (i.e. the setup, read me and setup.gcd files are actually totally free from malware. This issue can be solved either by rebooting your computer in safe mode with networking or a quicker method is to temporarily turn off your security software to allow the installation. You could also try whitelisting the setup.gcd file. In the almost 12 years this game giveaway site has been operating there has 'never' been a game given away that was infected with malware. 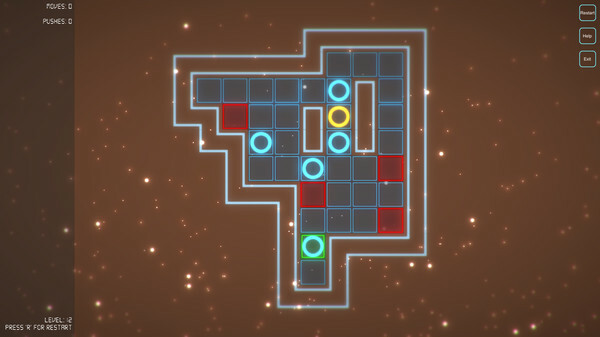 If Glowing Sokoban doesn't interest you, but you still hanker for something new to play, you'll find details of some game deals whether they be sale items, indie bundles or games being given away for free HERE (I've not updated the thread in a while, but most of the links still take you to the latest deals). In my opinion, should not be listed here, cheapens the entire site. What's offered is just a "demo" consisting of the first 10 levels, then with a message for you to buy the rest. Phooey on that. Totally agree with you. Even demos give you longer than you get to complete this game. Sokoban is one of my favorite games to play. This is terrific! Jeffrey K Benham, It's not just terrific, but terrific with an exclamation mark? Have you not observed that this is a demo. Ten minutes (ok 15) and it's over. Jeffrey K Benham, It's not just terrific, but terrific with an exclamation mark? Have you not observed that this is a demo. Ten minutes (ok 15) and it's over. Frank, I posted that after doing 6 levels and before knowing there are only 10. That was a good 5 minutes of entertainment. Only 1 level was even a little challenging. That's sad. The game downloaded quickly and was easy to install. It is just 10 levels of the game, but it was fun to play. The music was ok, but a little bit on a kind of harsh tone, I think it would be better if the music for that game had more softer tones, like in Osokoban (I may have spelled that game wrong) . I did go to their site and see that they have a number of other very fun looking games to offer also, so I think it is a great introduction for me to their site. I do think they should have included more than the ten levels for the download. I would like to thank them for the free game and the introduction to their company. I also would like to thank you, Game giveaway of the day for providing the game here. I couldn't find any instructions - but figured out that you play with the keyboard. 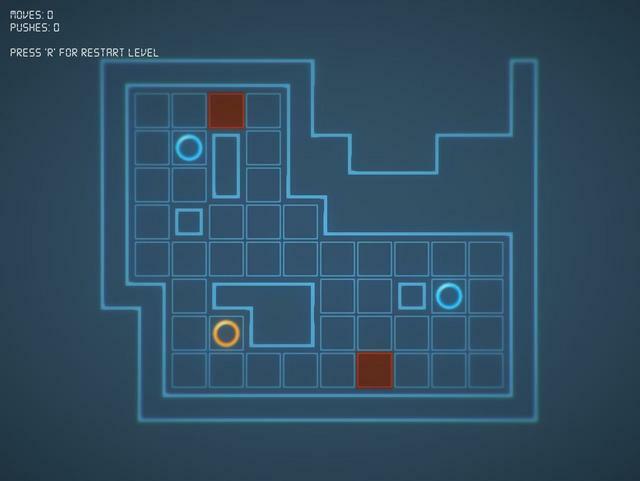 You use the arrow keys to move the orange circle around to push the blue circles into the blocks. 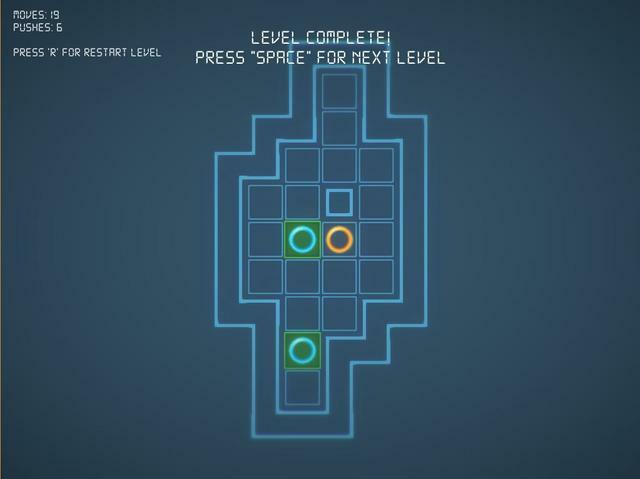 The level ends when all the blue circles are in a block. The strategy is to not get stuck - but in the corner it shows that you can press "r" to restart. However, after playing a few levels and exactly 10 minutes it flashed a message : "Congratulations you've reached the end of the game." It took longer to download and install the game than to play it. Game has potential but is missing several key components to make it a complete game. For example by showing you a target to reach for the least amount of moves etc. I couldn't find any instructions - but figured out that you play with the keyboard. 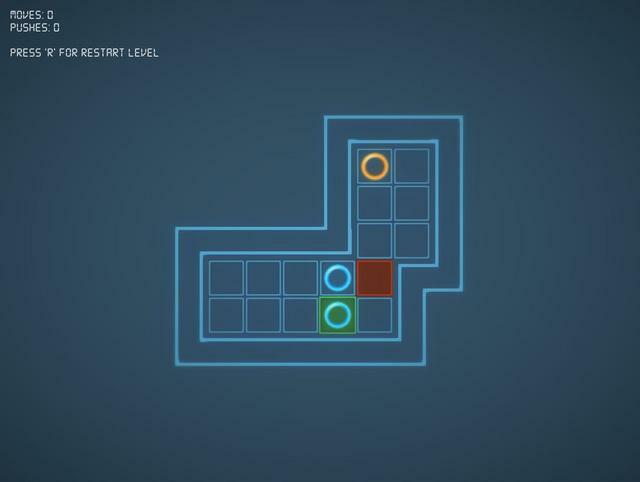 You use the arrow keys to move the orange circle around to push the blue circles into the blocks. 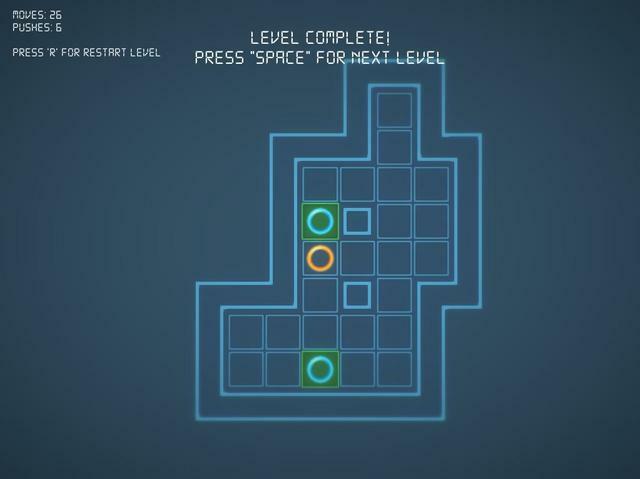 The level ends when all the blue circles are in a block. 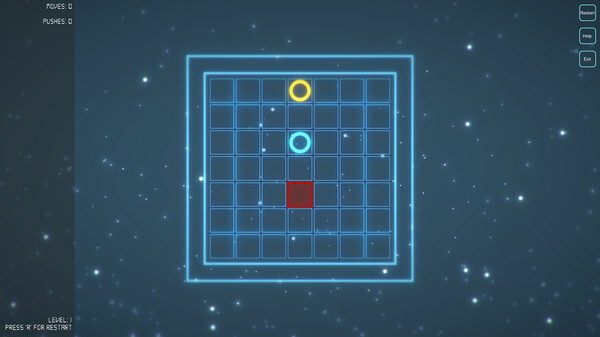 The strategy is to not get stuck - but in the corner it shows that you can press "r" to restart. However, after playing a few levels and exactly 10 minutes it flashed a message : "Congratulations you've reached the end of the game." Definitely not 60 levels. It took longer to download and install the game than to play it. Game has potential but is missing several key components to make it a complete game. For example by showing you a target to reach for the least amount of moves etc. Thank you for your review, appreciated. A reviewer, I have only played the 1st 3 levels so far. It will be a bummer for there to be only 10. No need to apologize. I'll delete it for you.